Welcome to this English blog! I decided to start blogging in English. Some articles are from my last posts on Facebook wall, but I will post articles here in order to brush up my English . I started learning English conversation since I was 21, and I've been in the current English school since the end of August 2011. This school is my 3rd one. More than 10 years in total (the first for 6 years, and the second for 2 years). 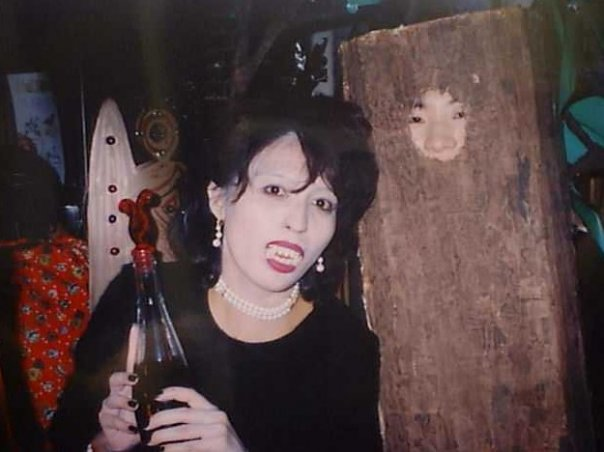 Halloween Party on October 31, 1998. I was a tree. I have a lot of friends in the US, but I am afraid to visit there now because of the new president. I am making a living with my websites as self-employment. I established my main site since January 25, 1999. Until now I've been involved almost exclusively with the technical aspects of things, and I've been writing articles on how to use software for Microsoft. I have a strong passion for creating resources that do not exist, especially for minor software. I got the chance to publish books via my website. I wrote 7 books actually. Now I am writing articles on my websites instead of writing books. The other English site is here. Feel free to contact wanichan if you have any questions or comments.